Sixty years ago, in the understory of the Appalachian Mountains, my sisters and I played canning with our cousins. We pulled off the grainy flowers from plantain stems and stuffed them into Aunt Eloise’s dusty, old jars. Our Great-grandpa Hunt didn’t intend his shed to become our playhouse and shelter from rain and sun. A carpenter, he had built it for serious work. Drying hand-hewn wood, for instance. By the time his great-grandkids came along, the outbuilding stood vacant. Toothless and suspendered, Great-grandpa Hunt observed our carefree, mechanized generation with bewilderment and disapproval. Aunt Eloise, on the other hand, praised her new electric toaster. The novelty offered an option to her breakfast biscuits. And she was thankful for Great-grandpa’s woodshed that kept us kids from tracking dirt onto her spotless floors. And I’m thankful, too. For it is the fragrance of wild pawpaw I remember most about Great-grandpa’s little shack in the timberline. The yellow mushy fruit lay smashed on a huge rock that was flat as a pancake and large enough to square dance. I didn’t notice the black seeds, or that pawpaw trees grew by the side of the rock. I didn’t dare venture to touch the fruit for the risk of encountering a rattlesnake or copperhead. As a youngster, I was unaware the Appalachian Mountains were among the oldest on Earth. I had no clue the tropical, wild fruit came from trees rooted near a spring below. The delicious pawpaw, traditionally known as “the poor man’s banana”, is native to 26 states, including Michigan—praise God! And if you’re fond of chilled custard and mango as was our beloved George Washington, this is your dessert. 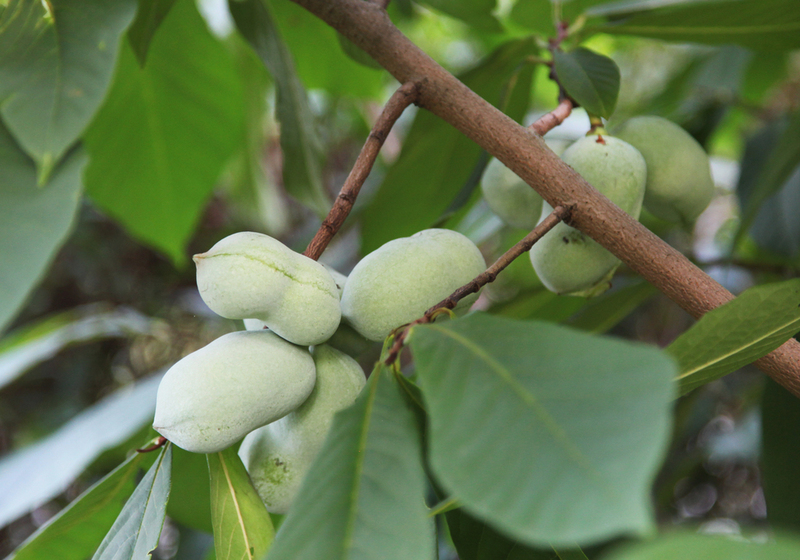 Furthermore, Lewis and Clark fed on pawpaw fruit during their expeditions while traveling our nation’s rivers. Come next September, I plan to branch out into Michigan’s streams with my kayak in search of the Asimina trilby. And guess what Thomas Jefferson grew in Monticello’s orchards? My husband found pawpaw saplings for sale in the gift shop’s garden center this past month. There’s proof Jefferson shipped pawpaw seeds to his Parisian friends to impress them. If Washington and Jefferson were alive today, I think they’d grieve over the agricultural and mountain knowledge we’ve forgotten. Most survival skills vanished with our grandparents’ generation. Many modern Americans cannot identify the common Broadleaf plantain and don’t macerate its foliage for drawing out venom from insect bites and stings. I was one of their number twenty years ago. Then I stepped foot into Dryden’s Seven Ponds Nature Center. You see, dear Reader, how childhood memories influence our lives. They guide our paths; reveal the steadfast goodness and beautiful food of God’s Creation. They won’t let us forget such significant things like the scent of the banana-mango pawpaw, the largest fruit of all fruit trees native to the United States. I’m prone to believe my great-grandfather’s stern face would soften if he saw our backyard’s puny pawpaw grove of three saplings. My tribute to his woodshed and our Appalachia.